This park is located at the main crossroads in downtown Hesperia. 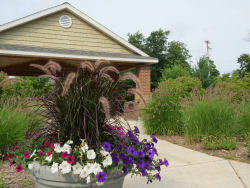 It is well-maintained and nicely landscaped, with working water fountains. 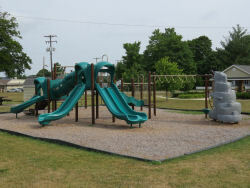 There is a modern playground with a climbing "rock" and various slides, swings and climbers. Gravel base. Restrictions- No camping, no open fires, no overnight parking. Hesperia is at the intersection of M-20 and M-120 on the Oceana-Newaygo county line. Webster Park is on the SE corner of that intersection.